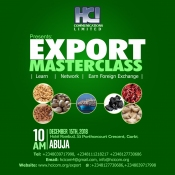 EXPORT MASTERCLASS ABUJA Starting a commodity export business is one of the most profitable decisions you can make. 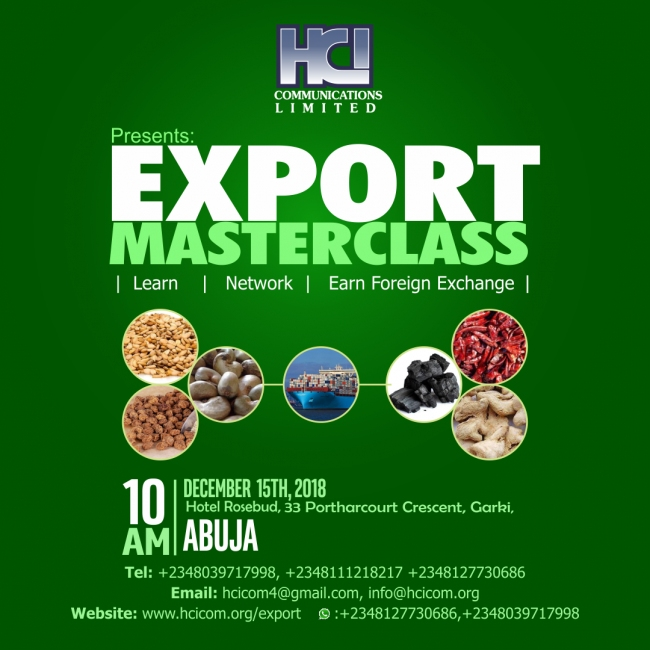 There are many products that are cheap and readily available in Nigeria but are in high demand in other countries, come let’s teach you how to start export business. WHAT YOU WILL LEARN AT THIS SEMINAR Modalities for getting foreign buyers and initiating transactions. Identification of the various commodities that can be exported to Europe, America & Asia. Export logistics, Haulage, Warehousing and freight forwarding. How to access export finance/loans. How to combine current employment with export business. How to access the various grants and incentives for Exports. How to package Nigerian produce to qualify for International Markets. Post training mentorship by very successful Commodity Exporters in Nigeria. For companies and individuals with immediate products to export, we will assist them get access to foreign buyers..
Bullet Description: Everything you need to know about export business with special focus on access to foreign markrt and a one year post training consultancy.